This paper is a case study that is part of a larger Ph.D. dissertation project: an exploration of the networks of references and ideas that make up the social lives of books online. In a time of rapidly evolving ecologies of reading and writing, I argue that the Internet affords us massive amounts of new data on previously invisible cultural transactions. New architectures for reviewing, discussing and sharing books blur the lines separating readers, authors and critics, and these cultural structures capture thousands of conversations, mental connections and personal recommendations that previously went unrecorded. I call these webs of references, allusions and recommendations ideational networks. Using Toni Morrison’s career as a model, I will closely examine the ideational networks surrounding her work using the methodologies of social network analysis in order to define a new, statistically informed conception of cultural capital in the digital era. My project is founded on the argument that as literary production evolves, new kinds of reading communities and collaborative cultural entities are emerging. Many of these communities are ephemeral and quite often they are fostered by commercial interests seeking to capitalize on their cultural production. Nevertheless, a handful of websites like Amazon continue to dominate the marketplace for books and attract millions of customer reviews, ratings and purchase decisions, and the literary ecologies of these book reviews have become valuable research resources. 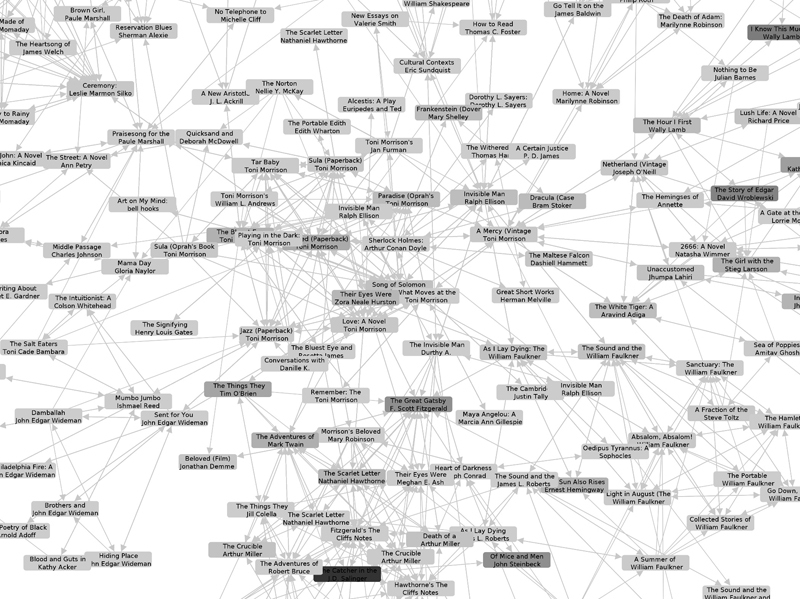 The ideational networks I explore are made up of first books, authors, characters and other literary entities (these are the nodes), and second the references linking them together as collocations in book reviews, suggestions from recommendation engines, and other architectures of connection. Advancing from my first case study, Thomas Pynchon, to Morrison’s ideational networks, I have discovered the utility of social network analysis methodologies to better analyze graphs of these literary references. With new data and new tools, I hope to trace the networks of influence and exchange that have contributed to making Toni Morrison arguably the most critically acclaimed and popularly successful author in the United States. This paper will present my research on the ideational networks surrounding the works of Toni Morrison. Morrison makes an excellent subject for this kind of study for a number of reasons. As a Nobel laureate and widely read popular author, she has attracted millions of devotees. In her writing she often draws on the African American literary tradition of the talking book, and throughout her career she has explored the ontological power of narrative to create and destroy worlds. It is not surprising, then, that as an author she is deeply committed to expanding the act of reading not only to include millions of people, especially women, who never considered themselves readers before, but also to changing its definition to include conversation, community, and a kind of collaborative reflection. This element of Morrison’s authorial appeal is best exemplified by her long-running association with Oprah’s Book Club, an enterprise that has had a huge impact on the U.S. publishing industry and on conceptions of reading as a social act. My presentation will explore the communities of readership that have emerged around Morrison’s work and consider the literary company in which her readers and reviewers perceive her. Focusing on a limited set of professional book reviews, reader reviews and recommendations from a dataset of print media, Amazon and LibraryThing, I will map out connections that reviewers and consumers have made between Morrison’s works and other literary figures and texts (see Figure 1). I believe these connections will delineate Morrison’s position as an extremely popular author who nevertheless challenges her readers to grapple with unflinching, emotionally raw narratives. Her books have introduced millions to deeply troubled corners of American history, combining a modernist style with diverse literary traditions in a way that is both acutely culturally specific and universally compelling. I hypothesize that these factors have driven her remarkable ability to create togetherness and communities of readership even as she traces out the wounds and scars of division, inequality and bias latent in American culture. I also hope to contrast her ideational networks with those of Thomas Pynchon, who has pursued a radically different literary approach through his aversion to publicity and his recondite fiction. Figure 1: Sample image from work in progress of a Morisson ideational network based on Amazon's recommendation engine. Here the nodes are books connected together by Amazon's "Customers who bought this also bought" feature, centered on Morisson's novels in the middle. Arrows indicate direction (i.e. Twain's Huckleberry Finn is recommended from O'Brien's The Things They Carried, but not vice versa). Note both the range of texts and the cultural vectors present, with syllabus classics like Salinger, Steinbeck, Miller and Howthorne moving down from the center, canonical Native American writers at the top left, etc. Visualization based on Prefuse Java Toolkit. This argument will draw on results from several specific datasets of ideational networks. I have collected professional book reviews from a set of major U.S. newspapers and magazines that consistently reviewed Morrison’s publications. These will be analyzed along with customer reviews from Amazon’s product pages for Morrison’s works, which have been accumulating reviews since 1996. Employing the MorphAdorner project’s Named Entity Recognition tool, I am assembling a dictionary of proper nouns that reviewers use as literary references in discussing Morrison’s work. Tagging those references in the reviews, I will then explore collocations of references to construct network graphs of the books, authors and other literary entities that reviewers link together. I have also assembled a database of book recommendations using Amazon’s “Customers who bought this also bought” engine and LibraryThing’s recommendation engine. These links provide a valuable counterpoint to those works that reviewers choose to mention, since these recommendations are generated by indirect user actions (i.e. when a user buys, reviews or catalogs multiple texts and thereby creates a statistical association among them). Recommendation engines attempt to mimic or track the sale and ownership of cultural products, creating a feedback loop of cultural consumer desire, while review analysis explores a more abstract realm of ideational exchange. Using methodologies of social network analysis, I will identify those works and authors with the most prestige (i.e. the books most frequently recommended) and centrality (i.e. the author who is best-connected to other authors) in these networks and consider the role of Morrison’s texts as centers of ideational networks and, potentially, as bridges between different genre or category groupings. I also hope to explore the role of clustering effects in these networks to see if they are based on predictable factors like genre. Depending on the speed of my progress with the objectives above and the cooperation of Oprah’s Book Club, I also hope to explore the networks of discussion and dialog that have emerged around Morrison’s long collaboration with Oprah Winfrey, which has inspired millions of people to take up or return to reading as a leisure activity in adult life. I hope to apply similar methodologies of literary reference to see how Book Club participants contextualized Morrison. As I continue to refine my understanding of ideational networks and improve the methodologies necessary to study them, I am beginning to develop techniques that can effectively be applied to very different authors and provide comparable data. This second case study will provide fertile ground for exploring Toni Morrison’s unique authorial fame and to map out the kinds of cultural production that large groups of committed readers can engage in online.